A team of researchers at Cambridge has identified how two key areas of the brain govern both our emotions and our heart activity, helping explain why people with depression or anxiety have an increased risk of cardiovascular disease. Changes in heart rate and blood pressure such as the ‘fight or flight’ response are a normal part of our emotional reactions. However, it is well known that people with depression or anxiety have an increased risk of heart disease along with distressing negative emotional states. The reasons why have remained unclear. Now, in a study published in the Proceedings of National Academy of Sciences (PNAS), Dr Hannah Clarke and colleagues from the University of Cambridge and Cambridgeshire & Peterborough NHS Foundation Trust have discovered a link between two key areas of the brain and emotional responses. They also show that our brains control our cardiovascular response – changes in our heart patterns and blood pressure – to emotional situations. To carry out the study, the researchers used marmosets with small metal tubes implanted into specific brain regions in order to administer drugs that reduce activity temporarily in that brain region. This enabled the researchers to show which regions caused particular responses. The marmosets rapidly adapt to these implants and remain housed with their partners throughout the study. In the first task, the marmosets were presented with three auditory cues: one that was followed by a mildly aversive stimulus (a loud noise), one that was followed by a non-aversive stimulus (darkness), and one where the subsequent stimulus had a 50/50 chance of being either a loud noise or darkness. The task lasted just 30 minutes and they were exposed to this task a maximum of five days a week over a few months. As the marmoset began to understand the cues, the researchers observed that the monkey’s heart rate and blood pressure increased in anticipation of the loud noise, and the monkey began to look around more (known as ‘vigilant scanning’). However, the team found that turning off one region (known as Area 25 – the subgenual cingulate cortex) of the prefrontal cortex in the marmosets made them less fearful: their heart rate and blood pressure did not change and they became less vigilant. In a second task, adapted from a common rodent test of emotion, the team studied the ability of marmosets to regulate their emotional responses. In a single session of thirty minutes, an auditory cue was presented on seven occasions, and each time it was accompanied by a door opening and the marmoset being presented with a rubber snake for five seconds. As marmosets are afraid of snakes they developed similar cardiovascular and behavioural responses to the auditory cue associated with the snake as they did to the cue associated with loud noise. The next day, to break the link between the cue and snake, the researchers stopped showing the marmoset the snake when the cue was sounded. In this task, inactivating Area 25 meant that the marmoset was quicker to adapt: once the link between the auditory cue and the snake was broken, the marmosets quickly became less fearful in response to the cue, with their cardiovascular and behavioural measurements returning to baseline faster than normal. In both tasks, inactivating another region (Area 32 – the perigenual cingulate cortex) made normal fearful responses spread to non-threatening situations: the marmosets became less able to discriminate between fearful and non-fearful cues, showing heightened blood pressure and vigilant scanning to both. This is a characteristic of anxiety disorders. Previous studies of anxiety and depression in humans have shown altered activity in these subgenual and perigenual brain regions. However, as it is not possible to manipulate the brain regions in humans, it was not previously possible to say whether these brain regions were responsible for the alterations in behaviour and cardiovascular activity, or alternatively whether the changes in brain activity were caused by such alterations. 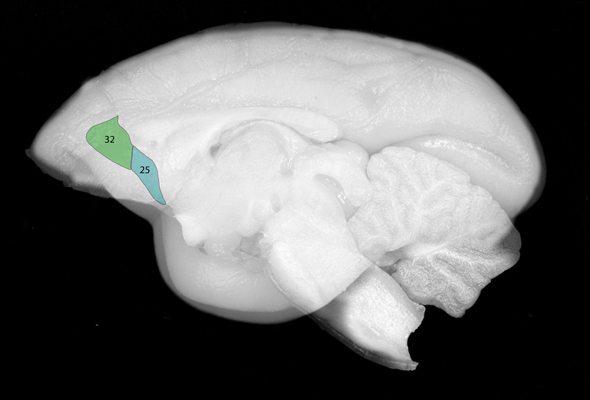 As the structural organisation of the prefrontal cortex of non-human primates including the marmoset is very similar to that of humans, the researchers were able to directly address this issue. Animals are only used in research where no other alternatives are available, and researchers always use the most appropriate species. In the vast majority of cases, this involves using mice, rats and zebrafish. Sometimes, however, it is necessary to use species that are closer to humans. While rodents can provide a good model for exploring and understanding many aspects of behaviour, the researchers argue that this study highlights how non-human primates in certain cases can help provide a more detailed and specific understanding of how our brains work. The research was partly-funded by the Wellcome Trust.